411 Marlborough is located on the NE corner of Marlborough and Massachusetts Avenue, with 409 Marlborough to the east, 421 Marlborough to the west, across Mass. Ave., 483 Beacon to the north, across Alley 414, and 416 Marlborough to the south, across Marlborough. 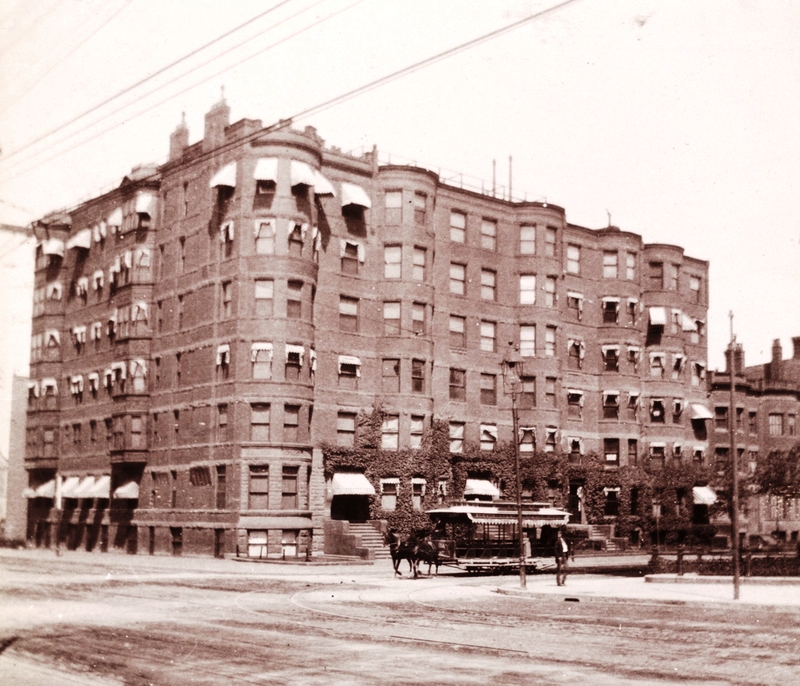 411 Marlborough, a six-unit apartment building, was designed by architect Samuel D. Kelley and built in 1890-1891 by Keening & Strout Brothers, masons, for jeweler and real estate developer Edwin B. Horn, Jr. It was a companion building to 409 Marlborough, a twelve-unit building built at the same time, and to 405-407 Marlborough, two six-unit buildings built for Edwin Horn in 1889. Edwin Horn purchased the land for 409-411 Marlborough on May 1, 1890, from Walter C. Cabot. He had purchased the land on January 17, 1880, from Grenville T. W. Braman, Henry D. Hyde, and Henry M. Whitney, trustees of a real estate investment trust. The land was part of a larger parcel originally purchased by the trust on March 1, 1872, from the Boston Water Power Company. 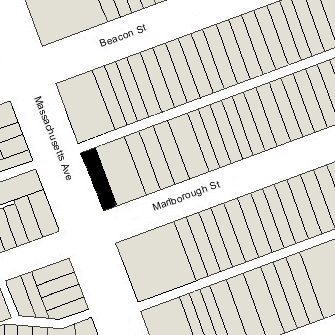 Click here for an index to the deeds for 411 Marlborough, and click here for further information on the land on the north side of Marlborough between Hereford and Massachusetts Avenue. 409 Marlborough and 411 Marlborough were purchased from Edwin Horn by real estate dealer Albert Geiger, 411 Marlborough on December 24, 1890, and 409 Marlborough on January 6, 1891. On January 5, 1891, 411 Marlborough was purchased from Albert Geiger by real estate dealer Samuel Horatio Whitwell. He was unmarried and lived at 111 Commonwealth with his sister, Sarah Louisa Whitwell. Samuel H. Whitwell died in March of 1904 and, under his will, his estate was inherited by his brother, Frederick Augustus Whitwell during his lifetime and then divided equally between Frederick A. Whitwell’s two children, Frederick Silsbee Whitwell and Natalie Silsbee Whitwell. In August of 1905, Frederick Silsbee Whitwell purchased 409 Marlborough. Frederick A. Whitwell died in July of 1912. On July 16, 1913, Frederick Silsbee Whitwell transferred a one-half interest in 409 Marlborough to his sister, Natalie. She and he thereby each owned one-half interest in both 409 Marlborough and in 411 Marlborough (which they had inherited from Samuel Horatio Whitwell’s estate following the death of their father). On November 1, 1916, Frederick S. Whitwell transferred his one-half interest in both properties to Natalie Whitwell. 409 Marlborough and 411 Marlborough remained under the same ownership until 1960. On January 30, 1918, 409-411 Marlborough were purchased from Natalie Whitwell by real estate dealer Charles H. Gosse, and on the next day they were acquired from him by real estate dealer Charles W. Rowell. The property changed hands and on May 29, 1922, was acquired by Grace Maria (Bishop) McClary, the wife of real estate dealer Walter Percival McClary. They lived in Melrose. On February 14, 1924, 409-411 Marlborough were acquired from Grace McClary by Gibran Kahlil Gibran and Faris Salem Maloof. Gibran Kahlil Gibran was a noted artist, poet, and philosopher, best known for his work, The Prophet. He was unmarried and lived in New York City. Faris Maloof was manager of a wholesale bakery and later would become an attorney and leader of the Syrian and Lebanese American community. He and his wife, Hanny F. (Malouf) Maloof, lived in Jamaica Plain. On March 4, 1925, 409-411 Marlborough were purchased by George Regina Boardman, the wife of Earl Griswold Boardman. They had married in May of 1924 and lived in Brookline. On May 27, 1926, she transferred the property to her husband’s sister, Clara (Claire) Althea Boardman. Earl and George Boardman divorced in 1928. On January 20, 1928, Clara Boardman sold a one-half interest in 409-411 Marlborough to Zelda (Jacobson) Greenhood, the wife of attorney Benjamin Harris Greenhood. They lived in Brookline. On June 3, 1931, Zelda Greenhood transferred her interest to her husband. Clara Boardman married in January of 1933 to Gordon Judson McCurdy. She continued to own a one-half interest in 409-411 Marlborough. Zelda Greenhood died in May of 1941 and Benjamin Greenhood died in August of 1948. 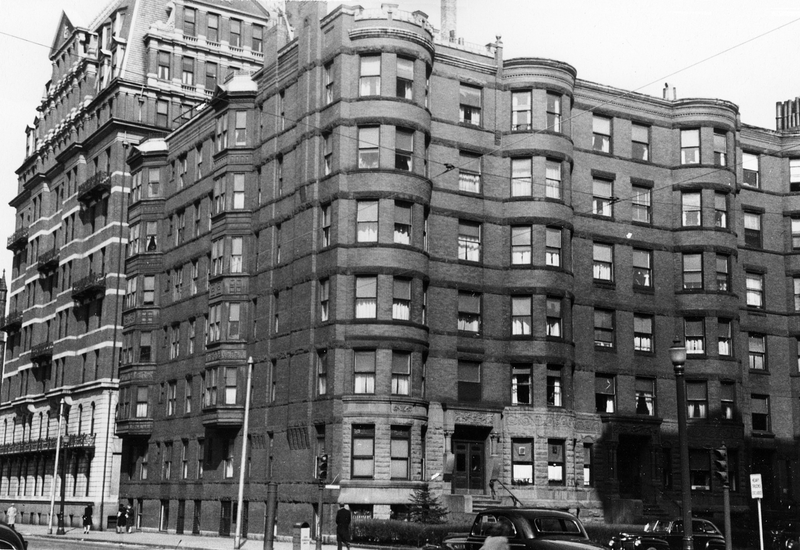 On November 1, 1949, the Greenhoods’ three children – Alfred M. Greenhood, Ernest J. Greenhood, and Bernard Lionel Greenhood, as trustees under their father’s will – acquired Clara (Boardman) McCurdy’s one-half interest in 409-411 Marlborough. On July 29, 1960, 411 Marlborough was purchased from the Boardmans by S. Zelig Rivkind. The Boardmans retained ownership of 409 Marlborough. On September 1, 1960, 411 Marlborough was acquired from S. Zelig Rivkind by Theran Realty, Inc. (Louis Theran, treasurer). The property changed hands and on September 19, 1969, was acquired by Alonzo Hilliard. He was a widower and lived in one of the apartments. He previously had lived at 351 Beacon. By 1971, 411 Marlborough had been converted into twelve apartments, one tailor shop, and one retail store (a delicatessen). Alonzo Hilliard died in March of 1973, and on May 13, 1975, 411 Marlborough was acquired from his estate by Russell L. Peterson and Donato F. Pizzuti, trustees of the Stanton Realty Trust. In November of 1980, the trust applied for (and subsequently received) permission to convert the retail store into a restaurant, making the legal occupancy twelve apartments, one tailor shop, and one restaurant. On May 17, 1982, 411 Marlborough was purchased from Russell L. Peterson and Donato Pizzuti by Russell L. Peterson and Alex A. Woycik, as trustees of 411 Marlborough Realty Trust. 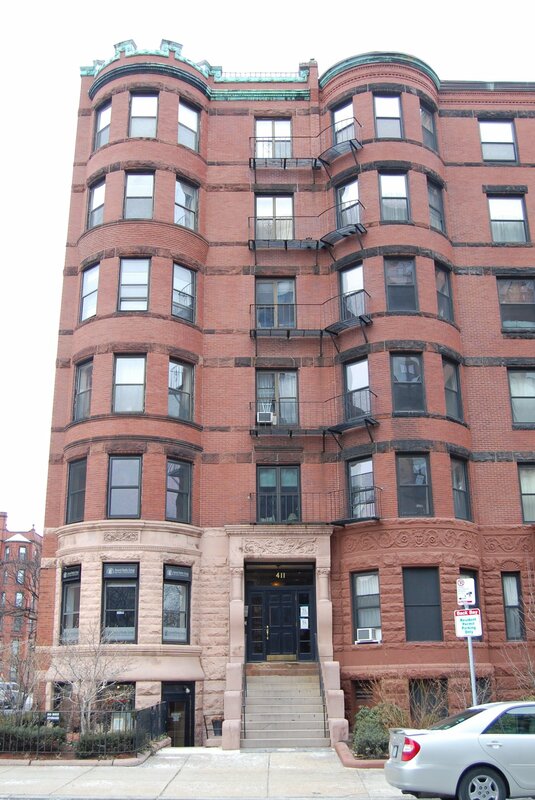 On the same day, they converted the property into eleven residential condominium units and three commercial condominium units: the 411 Marlborough Street Condominium.